Application of three-dimensional laser scanner in the measurement of open pit mine FAN Guo-min;China Gold Group Inner Mongolia Mining Co. Application of new technology in surveying and mapping in Mine Surveying SHEN Kai;Tangshan City new engineering survey and Design Co.
On the effect of mine survey on mine safety production ZHANG Zhen-shuo;Jiashi County Copper Hui Mining Co. Application and analysis of new surveying and mapping technology in geological surveying and Mapping Engineering LI Nan;Hebei land mineral rights evaluation & consultant Co.
Metallogenic conditions and prospecting for polymetallic deposit in Maguan County of Yunnan province old walled tin zinc WU Lai-hong;YUAN Jun;Yunnan Hualian mineral exploration Co.
Geological mineral characteristics and prospecting indicator of Pinghu REE deposit of ion-adsorption type in Meizhou,Guangdon WU Jiang-Wei;Minmetals Exploration & Development Co.
Maguan County stone slope Dulong tin zinc polymetallic deposit tungsten mineralization distribution law WANG Dai-bin;XU Hong-feng;Yunnan Hualian mineral exploration Co. Analysis on the problems and techniques of the plane control in the underground mine survey HE Yu-long;TIAN Cheng-hui;CHENG Guang-chao;Chifeng Chaihu hurdson Gold Mining Co. Mine geological exploration and disaster prevention and control HAN Fei;LIN Bin;China Steel Group Shandong Mining Co. Compared with the ICP-MS method for measuring gold Flame Atomic Fluorescence Spectrometry HE Xu;TIAN Yu-xin;Chengde Huakan NO.514 Geological Mineral Testing Research Co.
North Huaiyang area immortal scour-Metamorphism of horns-deformation analysis WANG Pei-pei;LEI Dong;NIU Ru;HAN Xu-yuan;Xi'an geological and mineral exploration and Development Institute Co.
Field turning of rotary kiln support wheel WANG Guo-Qiang;Sichuan Kai star Aluminum Co.
On innovation of mining machinery manufacturing and maintenance technology YU Chao;China Nonferrous Hongtoushan Fushun Mining Group Co. 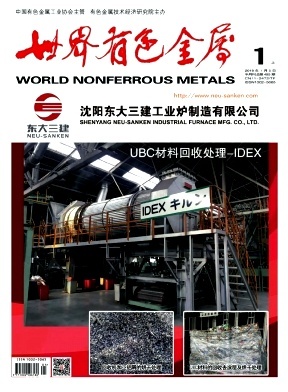 Countermeasures to improve the design level of iron ore dressing plant QIU Li-na;China non-ferrous metal industry Kunming survey and Design Research Institute Co.
Study on the mining method of thick ore body in a metal mine YANG Qi-Jun;WU Yu-wei;Qing Hai Yellow River Mining CO. Process flow of backfilling mining with horizontal stratified tailings in Lantau Peak copper mine Technical improvement RUI XIN-zhi;WANG Zhen-qian;Tongling colored stock Lantau Peak Mining Co. Discussion on mechanized point pillar upward horizontal slicing filling mining method Application and development HUANG Yuan-ming;Yuxi Mining Co.
On the influence of geology in construction on Mining Engineering LI Sheng;WANG Xiao-hu;Shandong iron and Steel Group Mining Co.
An analysis of the reasonable matching of transportation capacity and loading capacity of open pit mine ZHOU Wei-hua;Xinjiang Xuefeng Blasting Engineering Co.
Development of open pit mining technology and mining equipment QI Ye-ling;Bay Engineering Co.
Main characteristics and Prevention Countermeasures of tailings reservoir disaster ZHANG Chi;LIU Xiao-qian;ZHANG Min;China non-ferrous metal industry Kunming survey and Design Research Institute Co.
Development status of new technology for hydrogeological investigation of tailings reservoir CHEN Wei-cai;Fujian geotechnical engineering survey and Research Institute Co. Discussion on the safety and technology of mine blasting SHEN Bao-lai;Gongchangling branch of Anshan Iron and Steel Mining Blasting Co. Using digital imaging principle to carry out geological cataloue of mine tunnel ZHU Chao-Qun;Henan Jinyuan Gold Mining Co.
Water plugging technology of mine grouting under the condition of large mining depth and high water pressure LIN Zhi-biao;Beishan Mining Development Co.
Research on controlling for uniformity of Ru element of Gr29 alloy ingot Prepared by VAR Process WEI Fen-rong;WANG Hai;CUI Wen-jun;YANG Xiao-kang;LUO Bin-li;Xi'an Saite Simai Titanium Industry CO.
Study on heat treatment on Microstructure and properties of copper alloys influence JIANG Ying;Tongling colored stock wire Co. Analysis of the causes of stamping and falling off of zinc coating on hot galvanized steel sheet HUANG Geng;LIU Xue-li;Guangzhou JFE steel plate Co.
Study on current status and progress of lead and fire smelting technology in China LIAO Ai-min;Shenyang Nonferrous Metallurgical Design Research Institute Co. Application of automatic network control technology in metallurgical industry QU Kai-wen;LIU Yan-xia;Limited by Share Ltd of Shandong Metallurgical Design Institute;Wave Software Group Co.
Current status and development of energy saving and emission reduction of copper smelting LIU Jian;Daye Nonferrous Metal Co.
Current situation and development trend of waste acid treatment technology in copper smelting LIU Feng;Daye Nonferrous Design&Research Institute Co.
Development of metal titanium equipment based on direct reduction electrolysis process AO Wen-qing;New metallurgy hi-tech group CO. Thinking on optimal control of aluminum electrolysis process LIU Ke-jun;Guangxi Laibin Yinhai Aluminum Co.
Main problems of the non-ferrous metal industry safety production and improvement measures LI Hong-wei;China Nonferrous Metal Industry's Foreign Engineering and Construction Co.
Air inlet quality improvement method of Ma Tai 2055L slide air compressor YUAN Wei;Sichuan Kai star Aluminum Co. Analysis and Research on the application of Engineering Surveying and surveying technology LI Xin-xiu;Tangshan City new engineering survey and Design Co.
Study on the influence factors of the strength of high pressure jet grouting consolidation body ZHOU Hang;Shandong Zhengyuan Construction Engineering Co. Preliminary exploration of basic geological technology in geotechnical engineering investigation LIAO Bin;Nanchang Jing Kai District Planning and Design Institute Co.